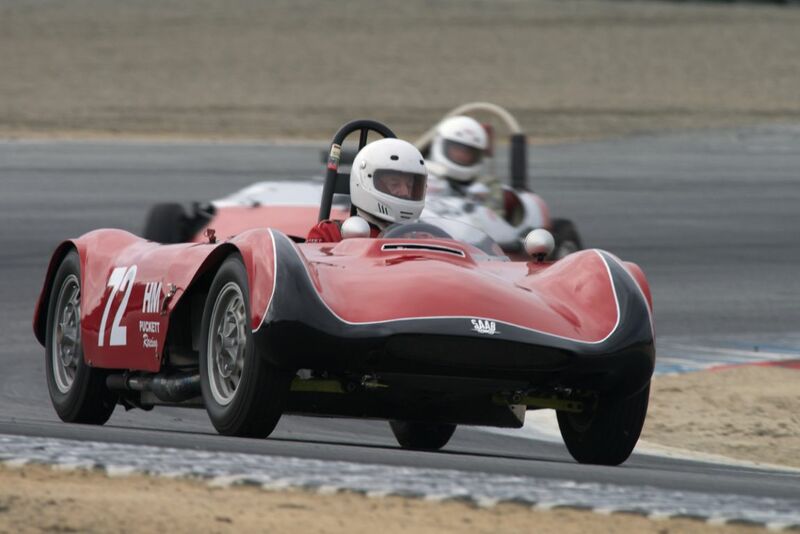 Historic Motor Sports Association (HMSA) held its 2014 Spring Club Event at Mazda Raceway Laguna Seca on March 22-23. 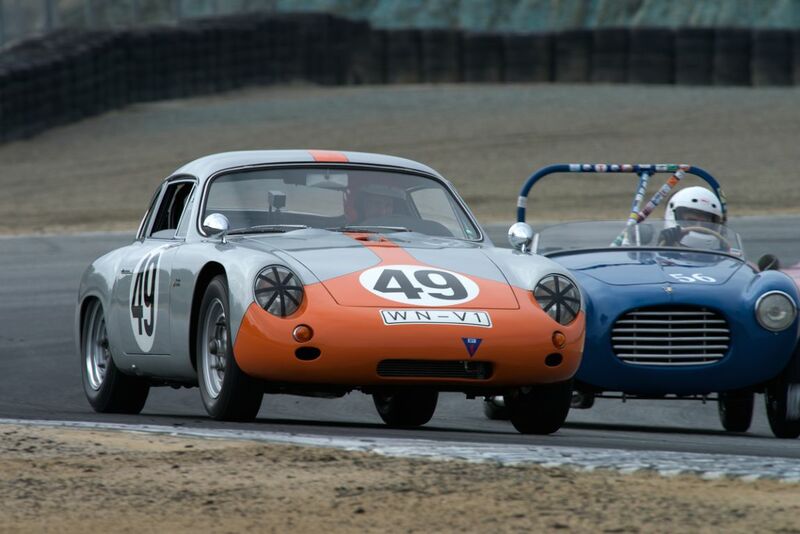 This year’s Spring Club event featured a strong field of approximately 175 historic race cars circling the 11-turn, 2.238-mile road course in Monterey, California. Saturday’s overcast morning burnt off to a clear bright day by 11am, while on Sunday heavy fog hung around until nearly noon. This ‘Monterey Sunshine’ is reflected in a number of the images. Notable entrants at the 2014 HMSA Spring Club Historic Races included ex-Arciero Brothers 1962 Lotus 23 of Jim Roth; Erickson Shirley’s Costin-bodied Lister Jaguar; Dennis Singleton’s 1974 Porsche 911 RSR 3.0; Tom Claridge’s beautiful 1965 Crossle C9S; Ed Matsuishi’s 1965 Porsche 911; 1979 Ex-Group 44 Triumph TR8 driven by Jay Moyes; Henry Schmitt’s 1997 BMW E36 M3 GTR; Jeff Gerkin’s 1973 BMW CSL 3.0; Brian Groza’s 1975 Sauber C4; 1954 Ferrari 750 Monza Spider Scaglietti of Scott Drnek; Jerry Rosenstock’s 1961 Alfa Romeo SZ; 1983 March 83G driven by David Andrews; Tom Malloy’s 1958 Lister Knobbly; 1960 Porsche Abarth driven by MPH; ex-Team Lotus Eleven of Stan Anderes and the trio of Shelby Cobras owned by Lynn, Steve and Tim Park. Prather Racing brought a truck full of Austin-Healey Sprites, MG Midgets and a mean-looking MG A. Straight from Wakarusa, Kansad, the Prather entries were all fast and well-prepared. 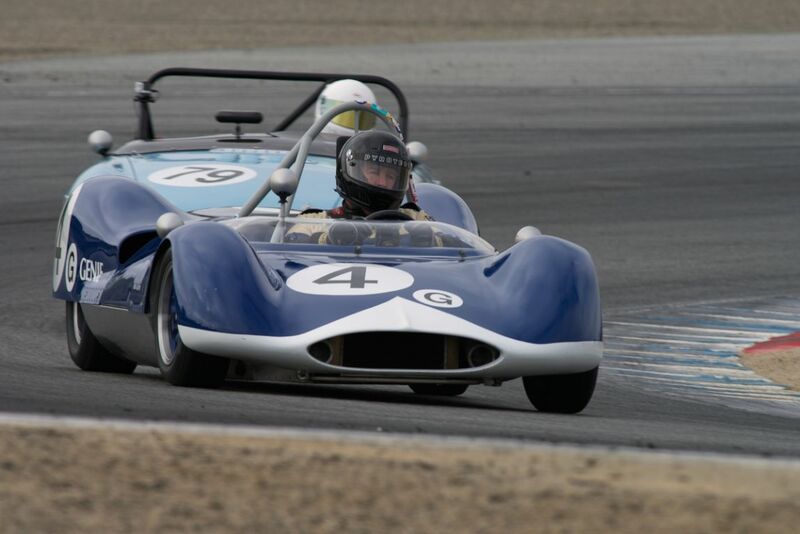 Similar to the 2011, 2012 and 2013 races, Senior Photographer Dennis Gray also documented the 2014 HMSA Spring Club Races at the famous Mazda Raceway Laguna Seca road course. We split up Dennis’ pictures into two galleries. The first gallery starting below features our favorite images, all displayed in the full-width view of Sports Car Digest, while the second gallery can be found on the last page of the article and gives a comprehensive view of all the photographs. 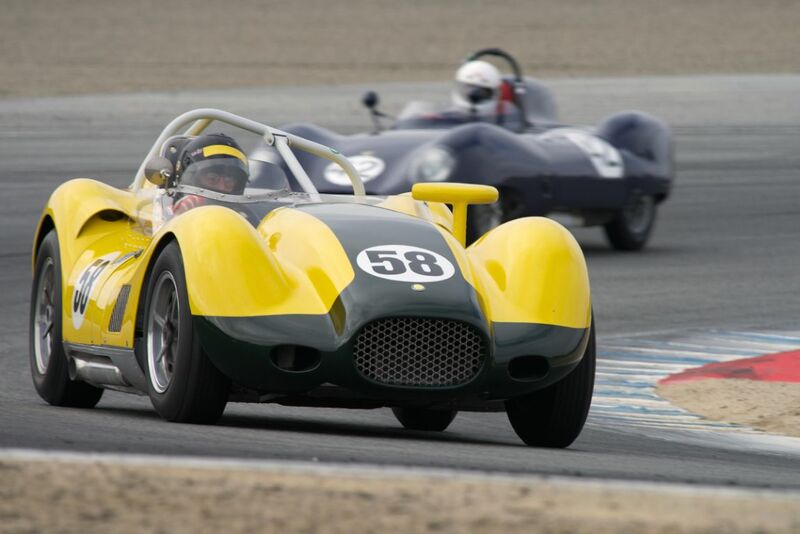 John Hurabiell’s 1956 Lotus Eleven leads the Costin Lister Chevrolet driven by Erickson Shirley through Laguna’s turn 2 Saturday morning. MPH threads this Porsche Abarth through turn 2 traffic during the early Saturday morning practice. Paul Perry’s SAAB Phoenix in turn 2. 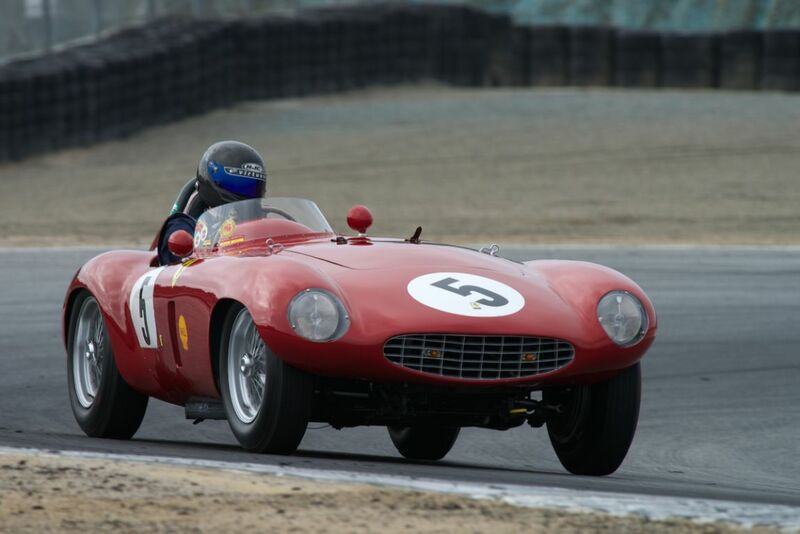 Scott Drnek in his 1954 Ferrari 750 Monza Spider Scaglietti in turn 2. 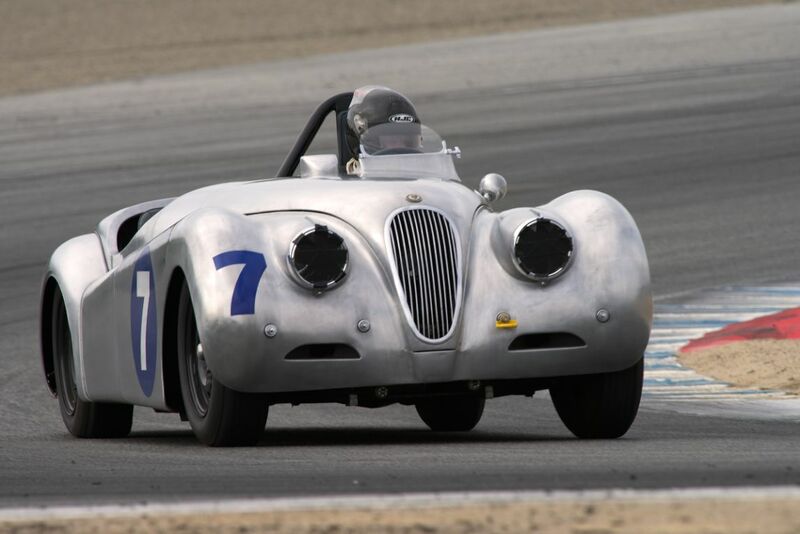 David Olson’s aluminum 1958 Jaguar XK120 in turn 2. Ex-Team Lotus Eleven driven by Stan Anderes. Bob Roth’s 1963 Genie closely followed by Adin Stein’s 1965 MGB. Tom Malloy’s 1958 Lister ‘Knobbly’. Great coverage Dennis, and the quality is up to your usual standard…Good to see your photographs of “home grown” American cars. Just a note, that the photograph of the “Flat Rad” Morgan + 4 surely is a 1952 (?) car and not 1962 as noted. Possibly could have been wrongly dated in the programme… Cheers from Sweden, Graham. Beautiful pics but number plate “Monza 0462” on Ferrari nr. 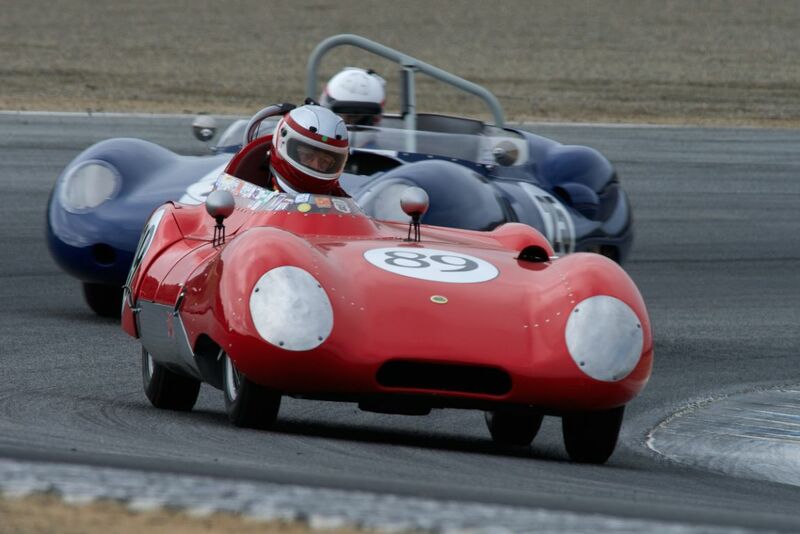 5 is misleading and caption “750 Monza… Chassis Type 510, Engine Type 119” even more. 0462MD is a 3-litre Mondial, Chassis Type 501, Engine Type 105. The 750 Monza wasn’t born in early 1954. More details in the book “In-line Ferraris” to be published shortly. I think your photography is outstanding as usual but I always wonder why you refuse to shoot any photos of the largest group there this weekend which was group 3 and there was 30 B-sedan race cars. I have noticed for years that you will shoot a 69 Camaro or Mustang but seemingly not a1969 Datsun 510 or BMW 2002 Why is that. There is certainly no shortage of photos of the cars you shoot year in and year out. I guess our group does not exist for some reason. 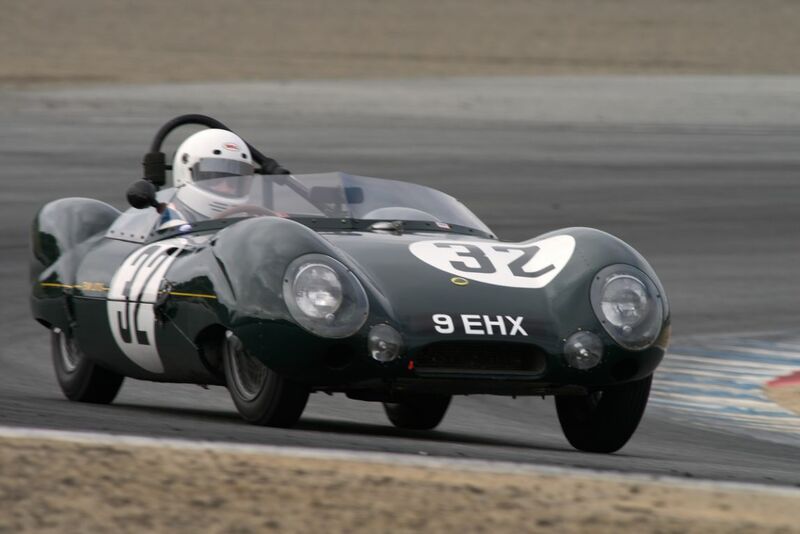 David Olson is certainly driving an XK120 but it is not a 1958 car. They only made 250 Aluminium bodied cars and they were the first XK120s. All were built in 1948 and production ceased in 1954 when the XK140 was introduced. That was succeeded in 1957 by the XK150.